Your career as a curator started in 1993 with an exhibition in the Central Museum Utrecht. Can you give an impression of how you have grown as a curator since then? ‘Your knowledge of how a museum works from the inside grows day by day. For example, you realize that for your exhibition to open, you only have two weeks to build it. You start thinking: why don’t all of you just work a little longer, even on weekends, for example. But you forget that the technicians go from one exhibition to another and a new one will be opened two weeks later. ‘And every museum has its own rules. The surveillance has its way of doing things, the canteen staff wants it to be done their way, and all of this is different again from how the director wants it to go. Dealing with all these layers I think is fun and interesting, but it can also be very exhausting. Your past is inextricably linked to fashion. Do you have the idea that the transition from fashion styling to setting up art exhibitions has been a natural process? You got a great chance in 2005 with 'Everything Dali' to show your talents in a large exhibition (in Museum Boijmans van Beuningen). Can you tell us more about how you handled such a massive subject like Dalí? ‘I was in the museum often to imagine the space. Dalí painted a lot of sunsets, in which the sky gradually changed its colour. That was my point of departure. ‘Consequently, I became convinced in 2012 to try it again in the Van Gogh Museum, with the exhibition ‘Dream of Nature’. Again, the museum was afraid that the colours would dominate the artworks. But the gradient on the walls, at an exhibition about painted nature, is just stunning! This time they were really painted. You have also worked with the Gemeentemuseum, for example for the Chanel exhibit, Romantic Fashion, Fabulous Fifties, Voici Paris, Fashion ♥ art. How did this collaboration originated? I can imagine that 'fashion ♥ art' (2011) has been a kind of ultimate exhibition for you. In the exhibition in the Gemeentemuseum you let fashion respond to art, bringing together your two most important worlds. Is that right? ‘Fashion can certainly be an art form and there is definitely a link between the two. Women who dare to wear special clothes are often artistic. You said your role as a curator is comparable to an actor. Do you mean that as an actor who plays a role for a film, you play a role for an exhibition? ‘To me it’s very important to dig deep into whatever the subject is. That digging is something I really enjoy! ‘I will go very far in that regard. Certainly with the intense build-up, if you know it will be over again shortly. By then, the subject is almost toxic to me. Sjarel Ex once said about you that you make something visible that we don’t see. Do you agree? What do you think is the essence of being a good curator? ‘To create 3D from 2D and vice versa, that’s an example of such a layer. Take the position of the Jacob’s ladder next to a real staircase, like in ‘All kinds of Angels’. Or at ‘Prints in Paris’, with prints of paneling, stickers of wooden floors and a rug with a shadow. I put a lot of effort into them. ‘Another example is in ‘Ode to Fashion’, when you see a picture by Sabrina Bongiovanni, with exactly the same doll as in the picture in front of it, so there appears to be depth. Your love for colours is immense. Can you say that a love for colour is essential for a good curator? Due to your love for colours, there is a lot of personal input from you in the exhibitions. For example, you do not show everything neatly at the same height, or the colour of the background is important. How do artists usually respond to your interventions? ‘Often, gallery owners are more difficult than the artist. But there is still a lot to do. I would like to style art even more. Like you do in fashion when you combine different clothes to create a new image. I could do that much more with art. Is each assignment a chance to pursue a kind of exploration? Is any new movie, book or piece of music a response to what came before it? ‘Yes, you always respond to where you are now. It is always layer over layer, response to another response. Picasso also looked at African masks before painting. This process never stops, and that’s what makes it so interesting. The question here is whether you as a curator also have to be a kind of an artist to do your job well. What’s your opinion about that? ‘I can only speak for myself but I would like to experience the subject (temporarily). For example, when I was busy with the romantic fashion show about the 1900s, I noticed that only paintings from that time period ‘speak’ to me. At that moment I had more difficulties with 20th Century paintings. 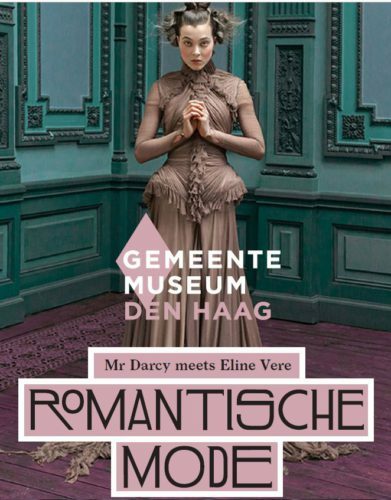 Meanwhile, the Dutch museums know where to find you for their exhibitions. What would be your advice to a beginning curator? Are there any sides to curatorship that you don’t think of as a starting curator? ‘You should like to interact with different people, not just want to do your thing. You work a lot with Tsur Reshef. I'm curious about what a design partner has what you do not have. If someone offered you an unlimited budget for an exhibition, what would you like to try? ‘Making installations with nature-related subjects. I love the beauty and perfection of nature and that nothing is as straight as an arrow.